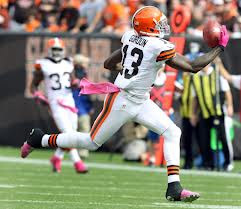 Gordon's bandwagoning allegiance and apparent trolling of the fanbase acted as a burr in the hides of some Cleveland backers. Ex-Brown and grumpy old thirtysomething LeCharles Bentley came out and absolutely wrecked Gordon, taking off his belt and delivering a 140-character whoopin' that I'm sure Gordon will learn absolutely nothing from. This is because, like all of us C-town bittermen, Bentley is just another "hater" ready to "creep back into the couches" after another soul-edifying triumph by Team Collusion. Gordon was not the only Browns' player battling it out with Cleveland fans over who he can cheer for. DT Phil Taylor shared similar feelings of joy at Miami's victory, although without the blockheaded douchebaggery of his suspended teammate. When confronted with his LBJ love, Taylor voiced his loyalty to Cleveland, couching that sentiment with the contention that nobody was going to tell him what to do. I hope I'm a #Brown for life and I love Cleveland but your not gonna tell me who I can and can't root for. "Can't do it, won't do it"
Fair enough, Phil, but here is where you and your sizzurp-sipping (allegedly) buddy lose the plot entirely. Support whomever you want, just keep that stuff out of the public eye. As football players at the highest level of competition, you'd think you'd know your surroundings better. Can't teach awareness, I guess. Discretion of this nature is particularly critical in Cleveland. Yes, we're sensitive. Damn straight, we're defensive. The national media loves the monkey show we put on when we get mad, and ESPN's 'Misery Montage' is a click away for the guys in the truck whenever a Cleveland team sniffs contention. We've also supported a football team that has done nothing on the field since 1994, and we're now sweating out yet another off-field fiasco that, who knows, may land our new owner in jail. Gordon's talking about parades. How about delivering a parade for a fanbase that's had its confetti, champagne and ticker tape boxed up since another LBJ was in the White House? It's not that hard to figure out, guys. Win, keep your smartphones in your pockets, and you'll be treated like kings in this town.